Everyone in this world aims at peace.But none knows the way to it. Those who have attained knowledge of the soul attain peace. That is attained again only by the grace of guru. The jeevan is immersed in samsaara by the ties of maya. He becomes subdued by the satva, rajas and tamao gunas. The jeeva wants liberation and the Lord to wants to free him. It is then that the Lord sends a Guru. The Guru consoles the jeevan, preaches the rama nama and unites him with the Lord. This is the crux of Ramayana. This is exemplified in Sundara kanda. In Sundara Kanda Hanuman is the Guru. 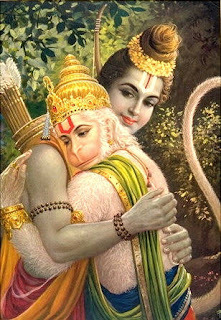 Sri Rama is Eeshwara. Seetha is the jeevan. Ravana exemplifies Rajo guna, Kumbakarna is the embodiment of tamas and Vibheeshana shows the satva guna. Maricha personifies Maya. Seetha was abducted by Ravana because of her desire for the deer ( maya). She was taken away from Rama ( Lord) and arrested in Ashokavana. This is nothing but the jeevan being subdued in samsara by the maya. It is then that Aanjaneya unites Seetha and Rama being an aacharya. Hanuman rose up the Mahendra mountains. He grew and grew in form. His devotees might fear that Hanuman was flying to Lanka single handed without any other support. Valmiki knew the fear. Hence He says “ This Hanuman alone would suffice to destroy the entire Lanka—Seethayaha Shatrukarshanaha.” He could fly across the skies. He could also swim across the sea. But he chose to fly across as he would reach Lanka speedily.